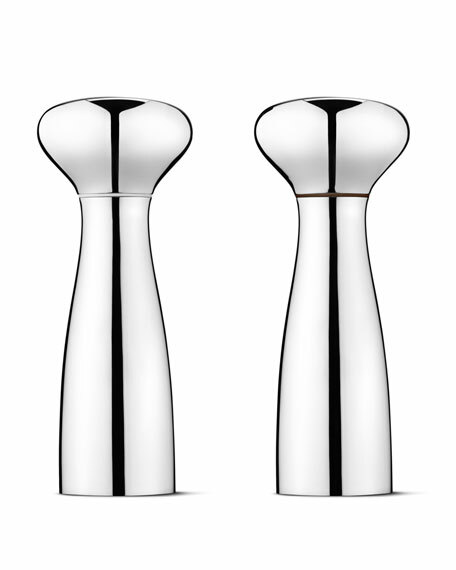 Stainless steel salt and pepper grinder set. EXCLUSIVELY AT NEIMAN MARCUS Ceramic salt and pepper shakers with beaded edges. Scrolled, leafy metal stand with twisted handle. 5.25"W x 2.5"D x 8"T. Imported. Stoneware salt and pepper shakers. Aluminum base hand-painted with gold leaf details. The metal base was designed for easy passing around your table. 5"W x 3.4"D x 6"T. Hand wash. Imported. Shakers made of high-fired white porcelain. Hand-applied 24-kt. gold luster decoration. Two-piece set; each, 2"W x 1"D x 3.5"T. Hand wash. Imported. Wildly appealing accent for your table. Set of two as shown; each, 1.5"W x 3"D x 3.5"T. High-fired porcelain with goldtone detaling. Arrives in Jonathan Adler gift box. Hand wash. Imported.